Ginger Howard studied architectural photography, and she’s even restored two historic homes. (She dedicated the book to “Jim and Jimmy Remond, always ready with hammer and nails.”) So for her first children’s book, she told the story behind a house built in 1637. “William knew just the kind of house he wanted,” her story opens. And soon she’s revealed that William is settling in America, though he was born in England. “William cleared an area 20 feet square,” Howard writes, dedicating a whole page to the saplings and trees used for posts and fences. Since they don’t have any glass, William uses a translucent animal horn to create a window for his wife. Then he builds a fireplace in the corner, and stuffs corn husks into a bag to make a bed. In fact, if this book has a fault, it’s that there’s too many details. 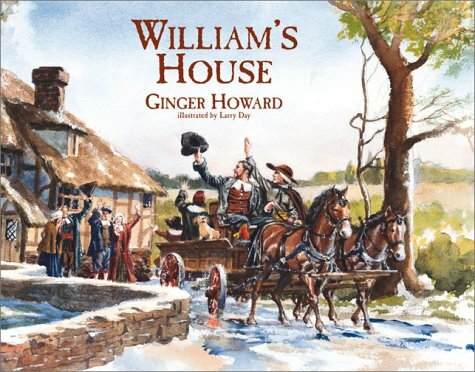 Howard lists out the tasty dishes eaten by William and Elizabeth, and the problems with their stored food that tells them it’s time to build a cool cellar. In August the winds blow, and William realizes that “It is windier here than at home in England.” So to save the home from being crushed by a falling tree, William next cuts down all his trees. The illustrations are colrful, drawn by an advertising storyboard artist named Larry Day. Day has two children, and used them as models for the children in “William’s House.” I like how he used an old-fashioned font on the title page, with a parchment scroll over a rustic landscape with birds in the sky. But like Howard, this is Day’s first book, and I wondered if that gave him an extra enthusiasm – or a novice’s uncertainty? Unfortunately, that’s the end of the book. Its whole story is about a construction project! But luckily, there’s a secret second story that’s scattered throughout the book. As Day’s watercolors illustrate the father’s worries about his house, Day tucks black and white sketches of William’s boys playing in the nearby woods. It’s a crucial component to the story, because it gives it an extra playfulness, and even some childish warmth. Howard’s text may offer a peek into 1637 – but thanks to Day’s cheerful drawings, readers also get two more!